WHEN NOT being breached by angry mobs, U.S. embassies around the world continue to engage in their long, delicate traditions of public and cultural diplomacy. This summer, I was invited by the State Department and the International Writing Program at the University of Iowa to join four other writers on a tour of southern Africa. The chance to do an infinitesimal bit of civic good—along with the opportunity to exchange the infernal heat of Washington, D.C., for the mild winter temperatures of a lower hemisphere—was enough to make me say yes. After several relatively easy days in Mozambique, our group braced itself for what came next: Zimbabwe, a country ruled for all 32 years of its independence by the bloody-minded Robert Mugabe, now 88. But in Harare, the capital, we went about the same sort of quiet business we’d conducted in Mozambique: talking to working journalists ($5 per article is about the going rate in “Zim”), conversing with much-published authors (we were never quite certain what political compromises their success might have entailed), and making presentations to schoolchildren. At one stop, feeling exactly equivalent to Yeats’s “sixty-year-old smiling public man,” I tried telling the story of Abraham Lincoln to a roomful of teenaged AIDS orphans. After a three-hour van drive through a dry winter landscape that resembles west Texas, we reached Masvingo, once Fort Victoria. 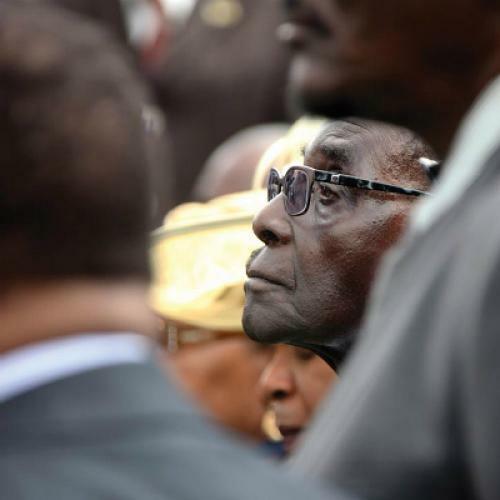 Our long-planned appearance at Great Zimbabwe University—its chancellor? Robert Mugabe—had been cancelled, so we decided to make do with the other items on our Masvingo schedule: more schoolchildren and one more group of journalists. Jillian Bonnardeaux, a State Department officer, genially remarked upon the “other” guests—the secret police—who were in our midst. We had also come to Masvingo for a Youth Cultural Arts Festival, and the evening we arrived there, we took its organizer, Leeroy Gono, to dinner. (Fried caterpillars were on the menu.) The next morning, we learned that he had been briefly detained for questioning. The festival’s main event, No Voice, No Choice, a pro-democracy play funded by the U.S. Embassy, had also just been banned by the district police, no matter that it had already been performed in Harare. Bonnardeaux briefed us on these developments inside the van, with the doors closed. WE WERE IN a police state, but a porous, strangely hopeful one. The Patriot costs one U.S. dollar, payable with just that. After the expropriations, violence and economic ruin ran a kind of mad relay race; by 2009, inflation had reached a point where the treasury had to issue a 100-trillion denomination of Zimbabwe’s own money. Imposition of the Yankee dollar brought stability, though most of the bills in circulation are so worn from use that they feel like ancient vellum. The tentatively stabilized country is somehow managing an economic growth spurt, but its future workforce is in and out of school from one month to the next, depending on whether families can come up with the fees. The “succession” preoccupies Zimbabwe’s citizens, especially those who have been victimized in one brutal way or another. We met one man whose parents, both professionals and members of the opposition, were chained inside their house and burned to death. Elections are still some way off, and Mugabe’s official photo-portrait, which has him looking serene if somewhat taxidermic, still looms over every airport corridor and hotel lobby. And yet, the coalition arrangements make for an oddly incomplete authoritarianism. Within hours of No Voice, No Choice being banned, an attorney from Zimbabwe Lawyers for Human Rights convinced a magistrate to lift the interdiction on the play and let the show go on. That evening, all the Americans were in the second row, with the mayor of Masvingo in the first, waiting for the play to start. The Charles Austin Theatre, opened by the white president of Rhodesia in 1973, still has posters for Gilbert and Sullivan and Christmas pantomimes on walls near the lobby; one can imagine the piano down front being played decades ago by some major’s wife. The program notes for No Voice, No Choice, describing the play’s stand against “politically motivated violence,” sound bromidic enough until one remembers the bravery still required to enunciate even the most minimal standards of democratic decency here. The play itself, written partly in Shona and partly in English, turned out to be a fast, whooping, and witty blend of sketch comedy, song, and dance that displays special sympathy for a character called Grievous Bodily Harm, a recovering torturer “now left to deal with the after effects of his acts as an unfortunate victim of unscrupulous politicians.” Reconciliation was in the electrified air. The audience roared its approval. A month later, back home and keeping up with events—another ban, another court challenge—I believe I can see the human statue that is Mugabe beginning to fall, not from a next rush of violence but from patient legal chipping at its pedestal. Thomas Mallon’s most recent book is Watergate: A Novel. This article appeared in the October 25, 2012 issue of the magazine.